Our Tax Team Works Diligently to Minimize Your Tax Burden. Complex tax laws can turn your dreams of financial independence into a nightmare of complicated paperwork. 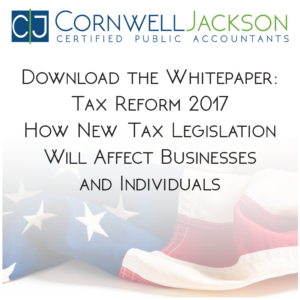 Seemingly every aspect of life, both business and personal, carries a different tax implication. At Cornwell Jackson, our tax team works diligently to minimize your tax burden. Our unique combination of taxation experts, positive attitude and a whatever-it-takes mentality result in tax solutions and services tailor-made to fit your specific needs and goals.